The Sunday Blog Share: a perfect day? This part of the Sunday Blog Share. Thanks to Suzie and check her out on Twitter at suzie81speaks. You have a whole day that is completely yours to blog, read other blogs, comment on them and just generally engross yourself in the blogosphere, without time watching. It doesn’t matter that the quick half hour you’d allowed yourself to feed your blog addiction, stretches into three hours, as you become deeply involved in the great blogs that are out there. There’s no need to feel guilty about ignoring your better half, family, and friends as they understand and are happy for you to shun them in favour of the blogosphere. Your house cleans itself, that pile of ironing does itself and everything is all hunky dory on the domestic scene. The kids look after themselves, beautifully and fabulously healthy meals magically appear on the squeaky clean table. If you feel inspired to post on your blog; and it’s very likely that you will, your post will be an inspiration. So, you’ll sit there in your pj’s and not feel guilty at all. You’re being creative and you deserve this. Except the phone is ringing and is that someone at the door? The kids are squabbling and the better half is asleep. The house looks like a bomb has hit it and how can you be sat there in your pj’s, at this time of the day? Yes, it’s back to the reality of finding the time to indulge your blogging addiction. This post has been thrown together, before my Duracell Bunny of a grandson wakes up and rules my Sunday morning. I’m not complaining, I love it and they don’t stay young for long. Life is very busy at the moment… know that feeling? I keep hoping for some more time to blog… but life keeps getting in the way. So, if I go missing , you know why. Thanks for dropping by here and have a great Sunday. Prev Sometimes life is like that: one whacked grandma. Next Arty – farty Saturday. I love this! Although I’m currently single again and have no husband/SO to justify to; I am a full-time student. I’ve been doing my best to make sure all of my academic responsibilities are done by Saturday, so I can own Sunday. It’s recently become my most treasured day. I love my hubby, but I am so envious. A whole day to indulge me… that would be so great, selfish maybe? But great. Lucky you… go for it girl. Exactly. Why do we feel so guilty, when we are actually working on our blogs? Reading and writing on them is all part of the process. We all need to toughen up and just for it. LOL! We’re lucky that we enjoy what we do. Why feel guilty? I know the feeling, oh so well. How does 30 minutes turn into four hours so quickly? I never saw time flying! Our best intentions go horribly wrong. And now I’m feeling guilty for not being able to respond to comments very quickly. Well, as I’ve said many times, at least you do respond to comments and questions 🙂 That’s all part of being an excellent member of our blogging community. If only we could set aside even one day a week for uninterrupted blog enjoyment. Now that would be heaven! Thanks for taking the time to comment on here. Maybe we should just do it. Just refuse to take part in life for that day. After all it’s writing and sometimes we writers need to be left alone! Oh, that sounds so pretentious. Back to grabbing the odd hour here and there then. LOL! Thanks for taking the time to read and comment on here. I’ll pop over to your blog, as soon as I can. Thank you for dropping by and I enjoyed visiting your blog. 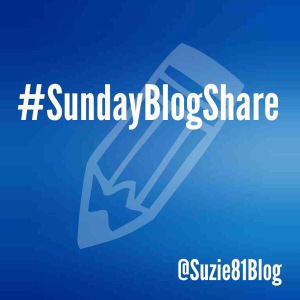 I think Suzie’s Sunday Blog Share is a great way to share great blogs and I was happy to retweet your blog. I don’t know how I would cope with moving. I’m bad enough when I go on holiday. I hope your move goes smoothly and that it gives you lots of ideas for your blog posts. Thanks for commenting on here and I’ll pop over to your blog for a read, when I get a minute. I bet you could use a minute as well…hey? Yes, it’s so easy to get stressed out and run down. If we are no good to ourselves, what use are we to others?